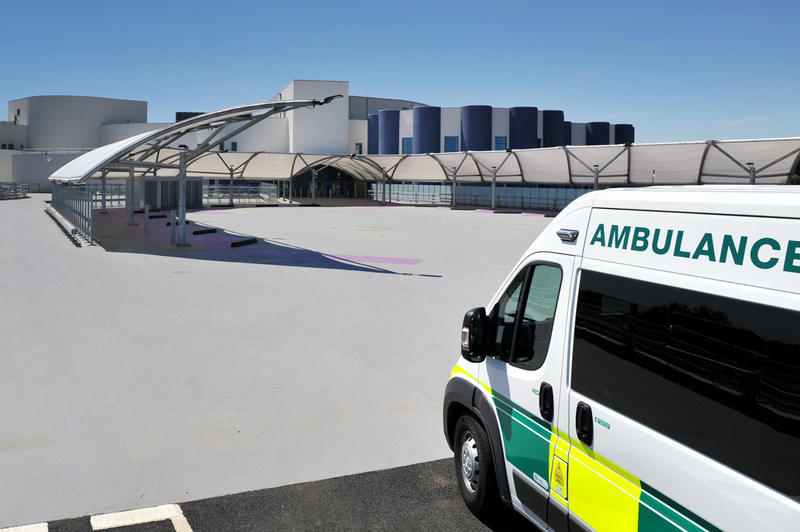 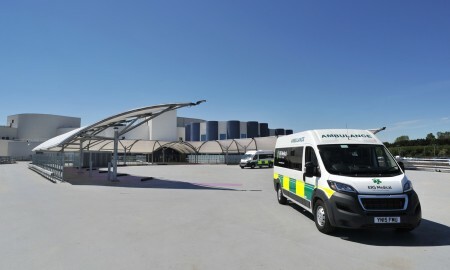 £75 million pounds has been invested by the NHS to erect this purpose built state of the art specialist emergency care hospital with a further £15 million invested on roads, infrastructure and new equipment. 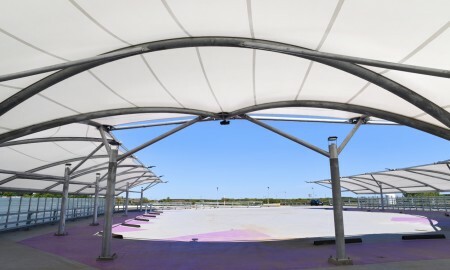 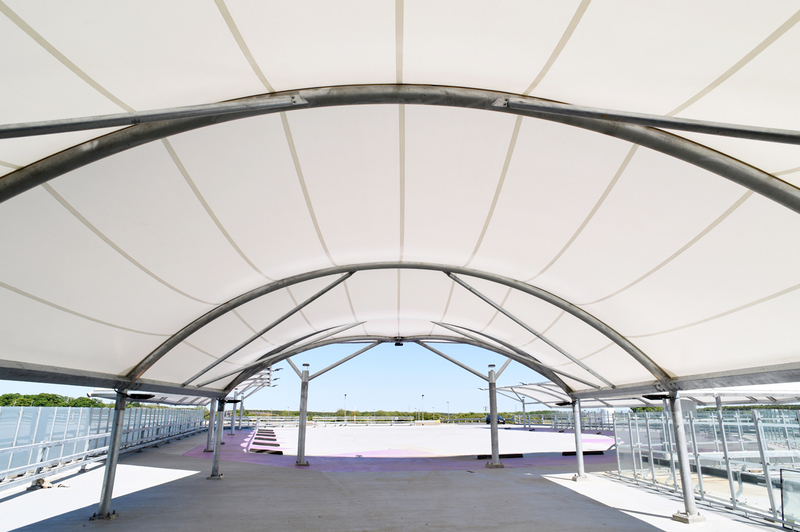 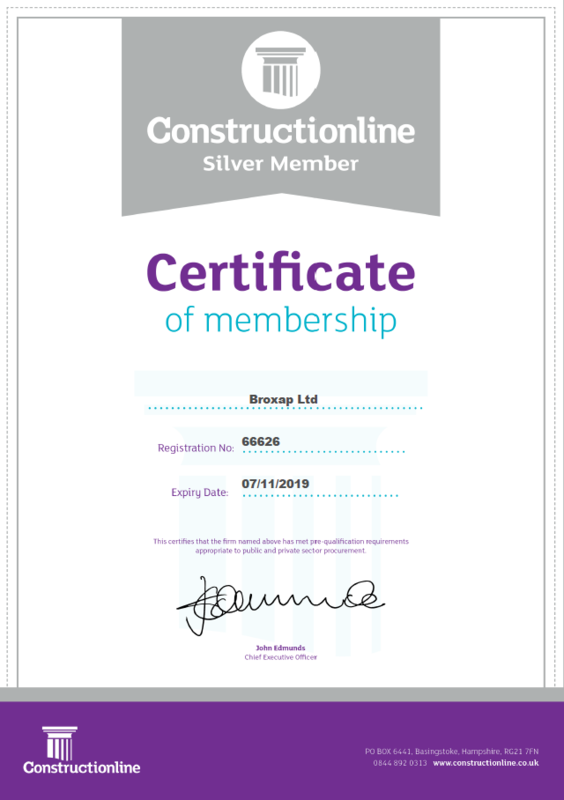 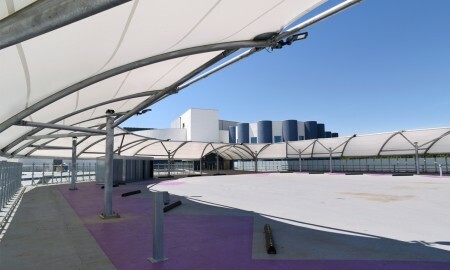 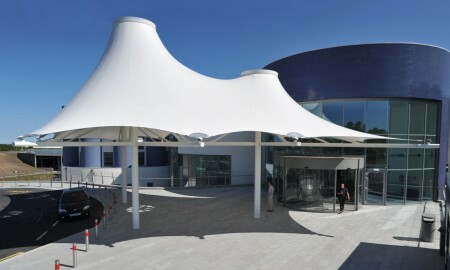 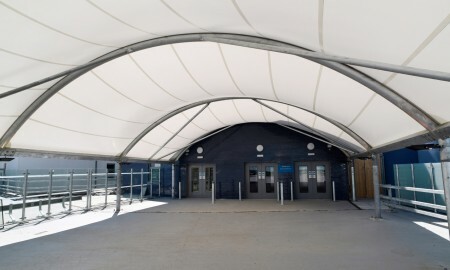 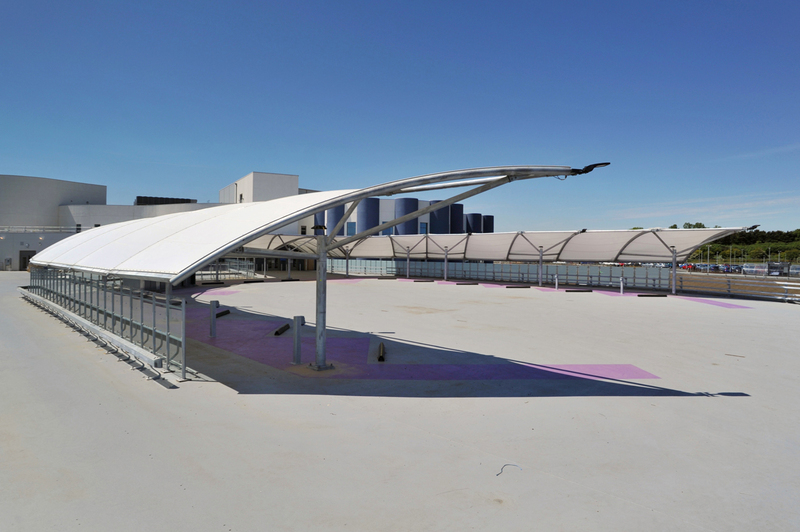 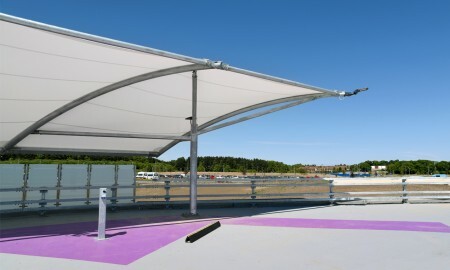 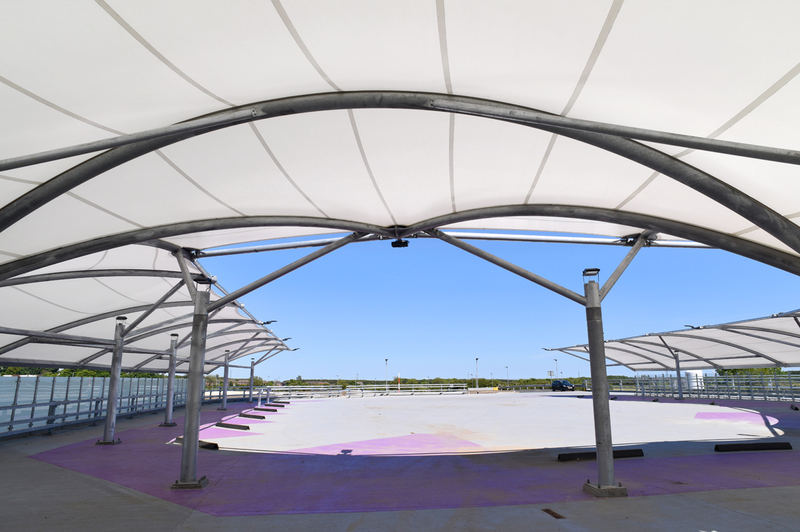 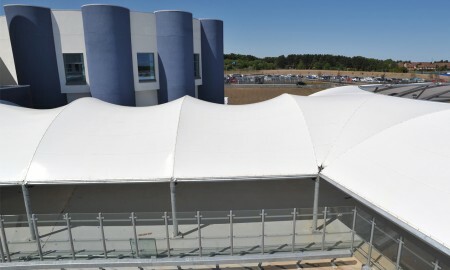 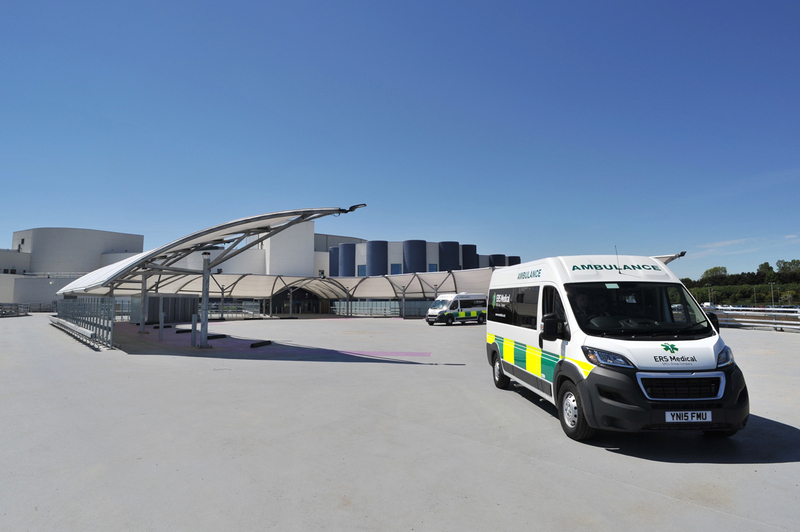 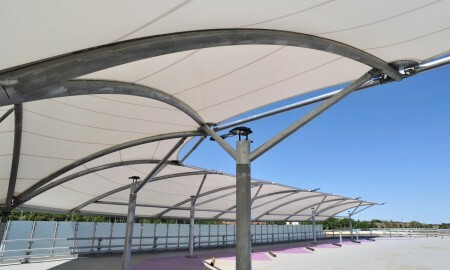 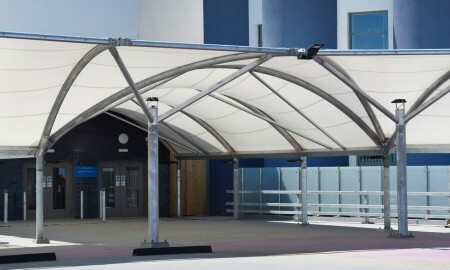 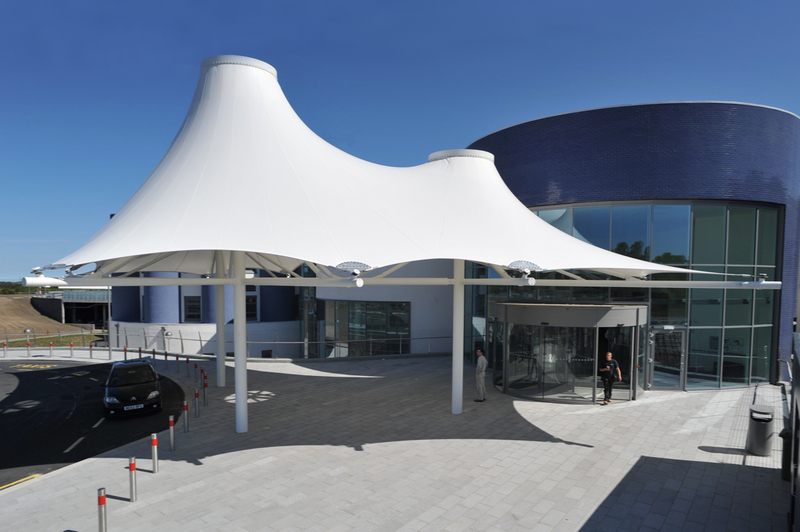 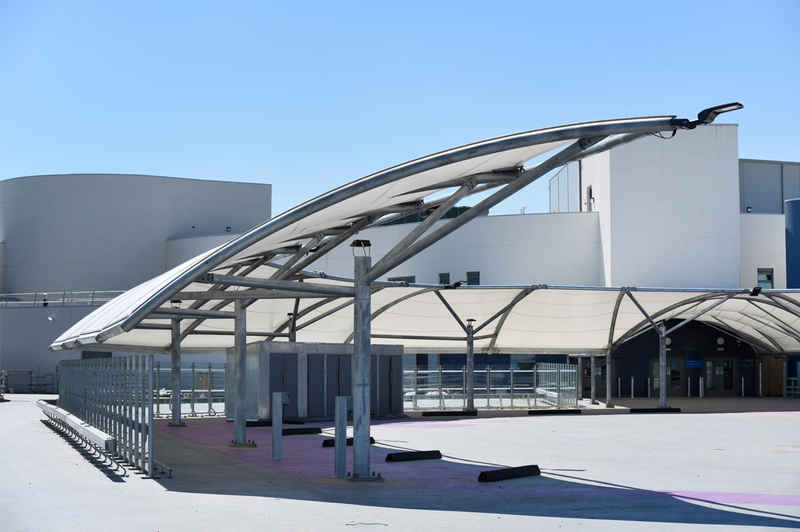 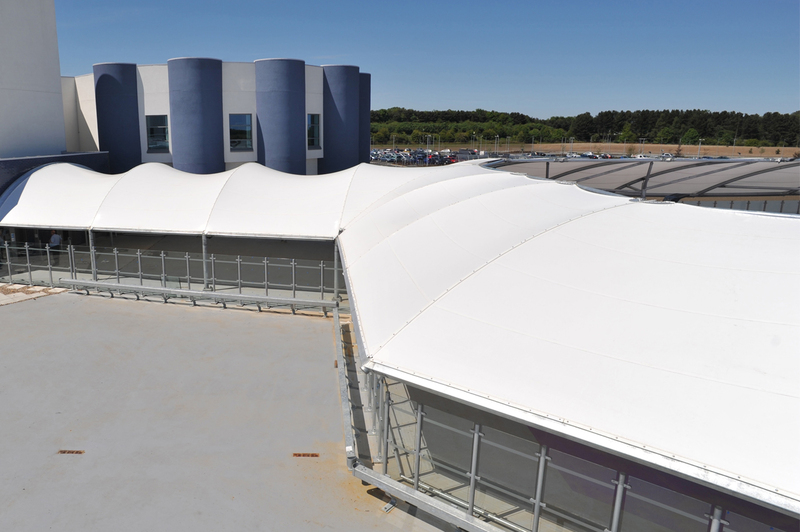 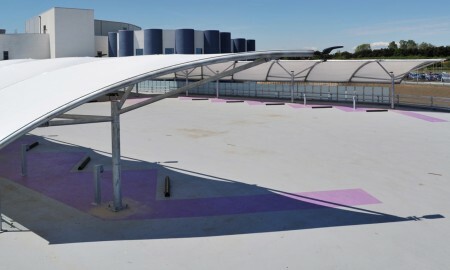 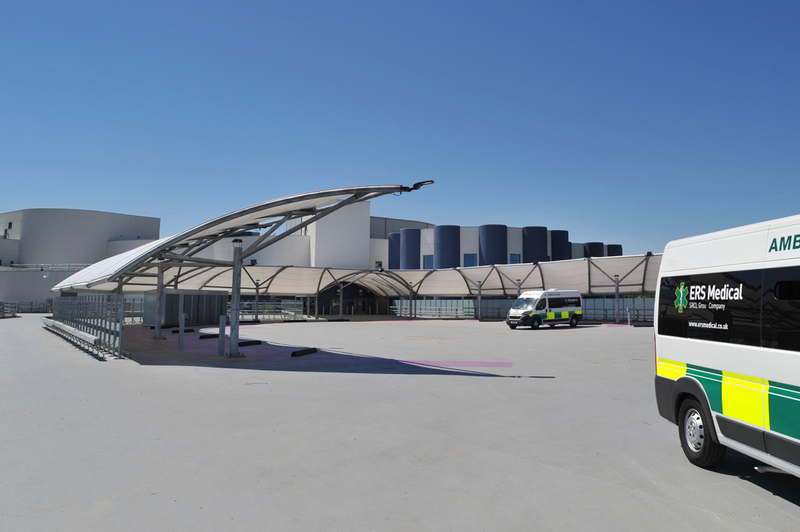 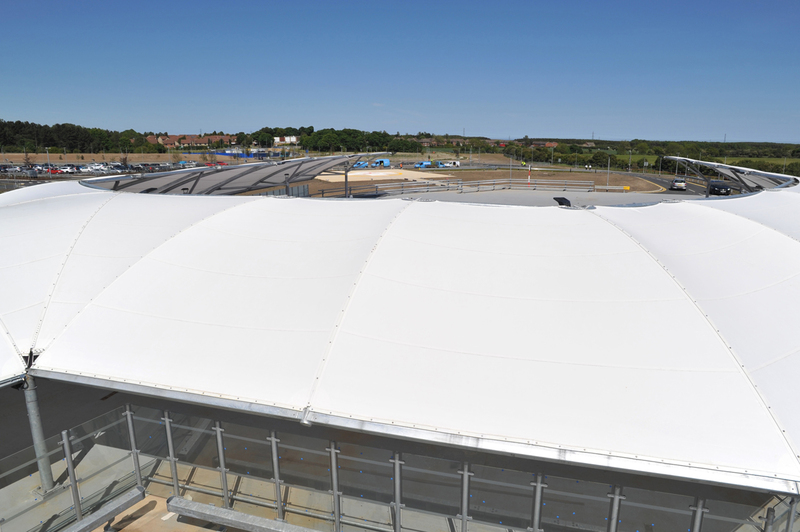 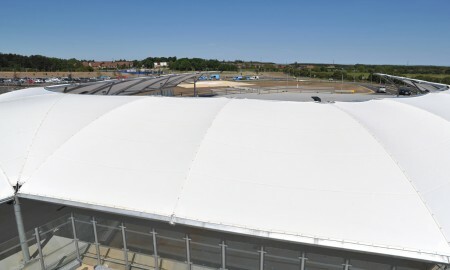 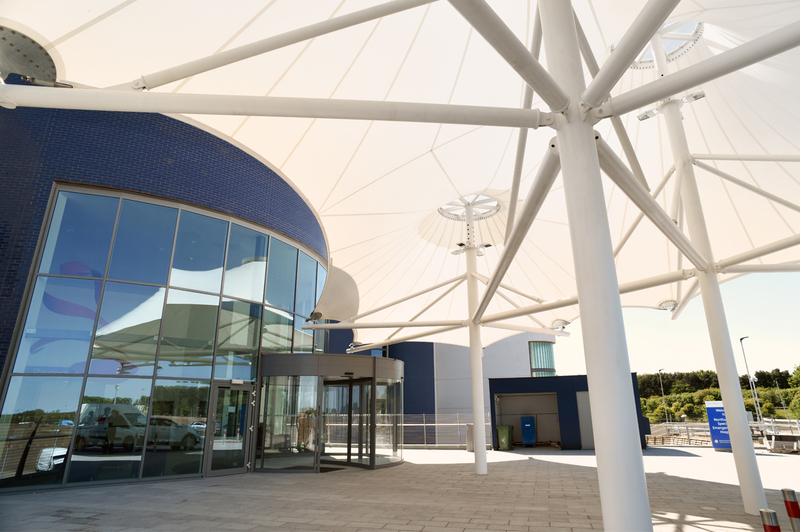 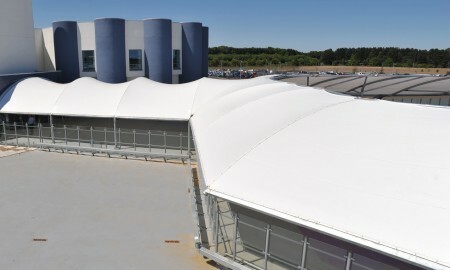 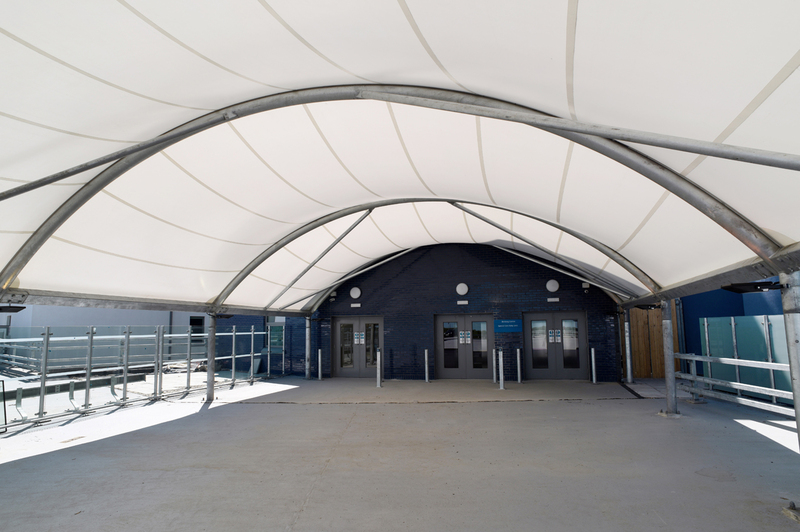 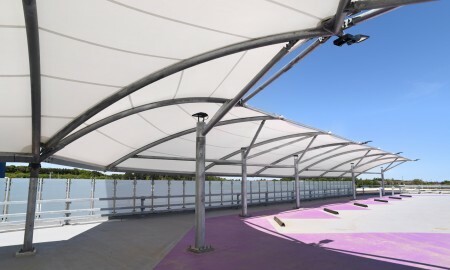 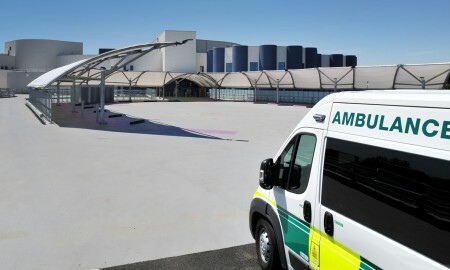 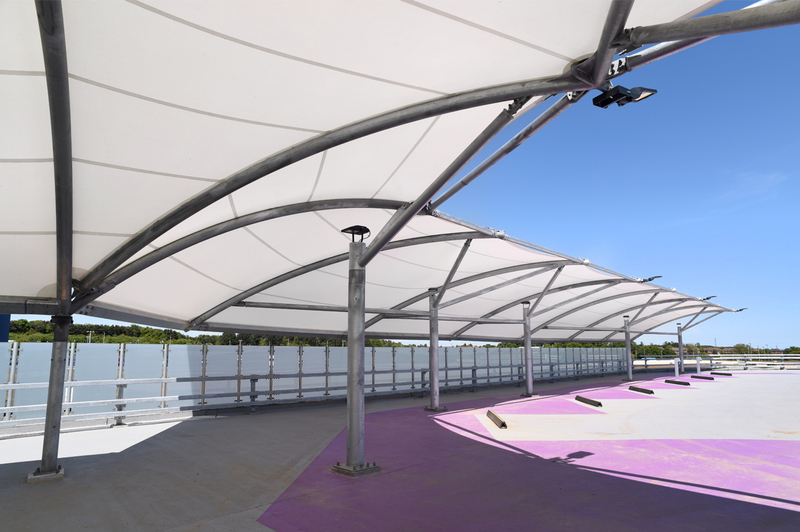 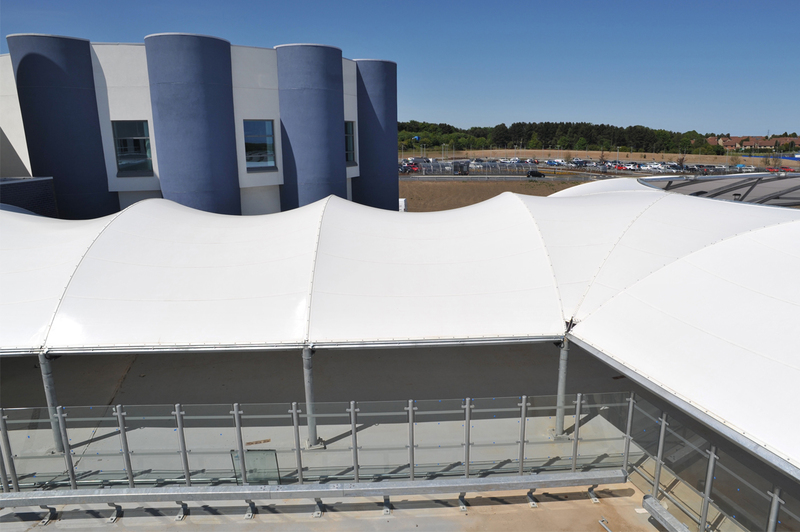 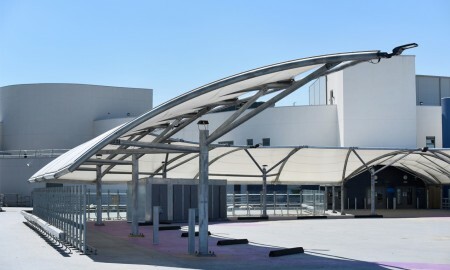 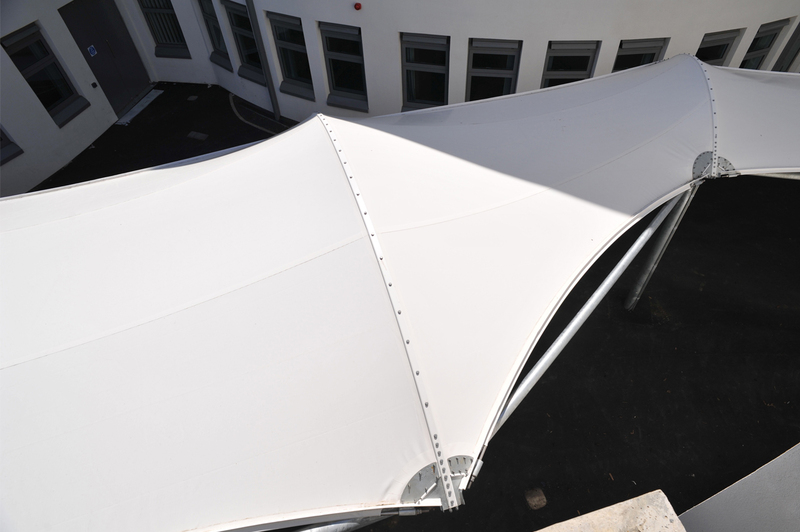 Broxaps’ Keep it Kool division was employed by contractors Lend Lease Construction (EMEA) Limited to construct a series of fabric tensile structures designed to give weather protection to the ambulance bay and also outside the main entrance. 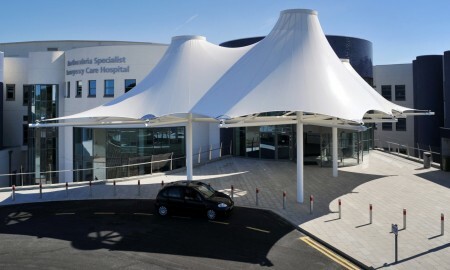 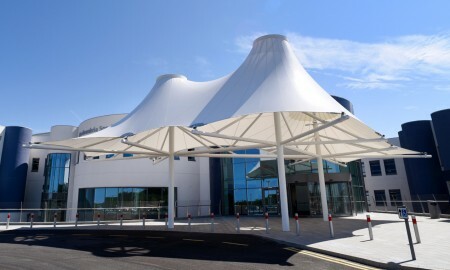 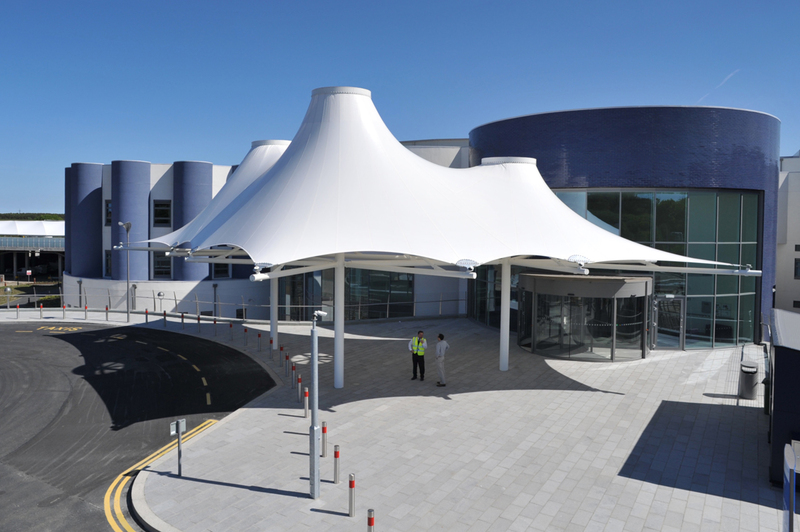 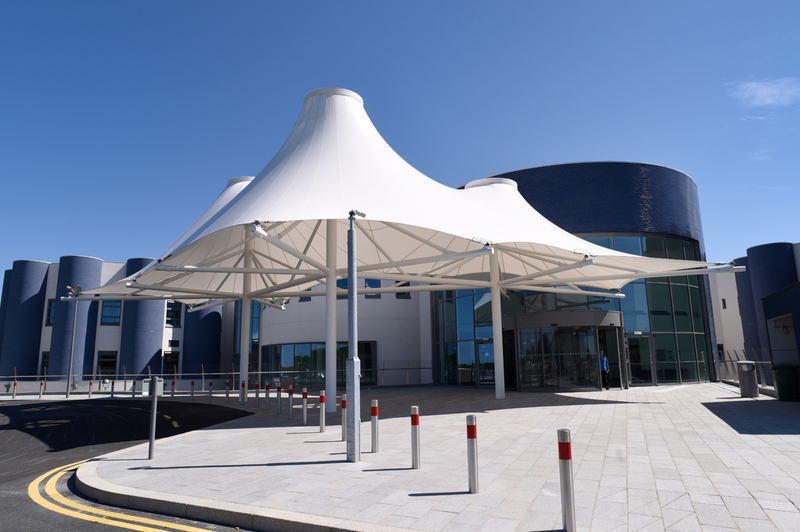 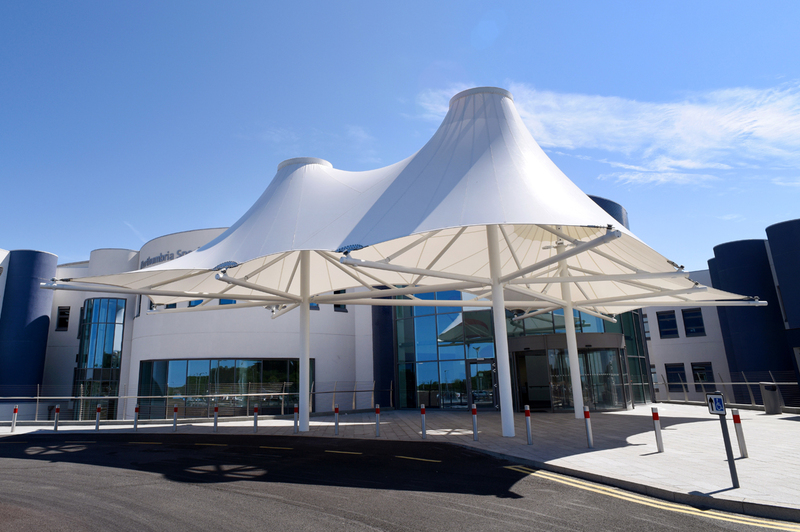 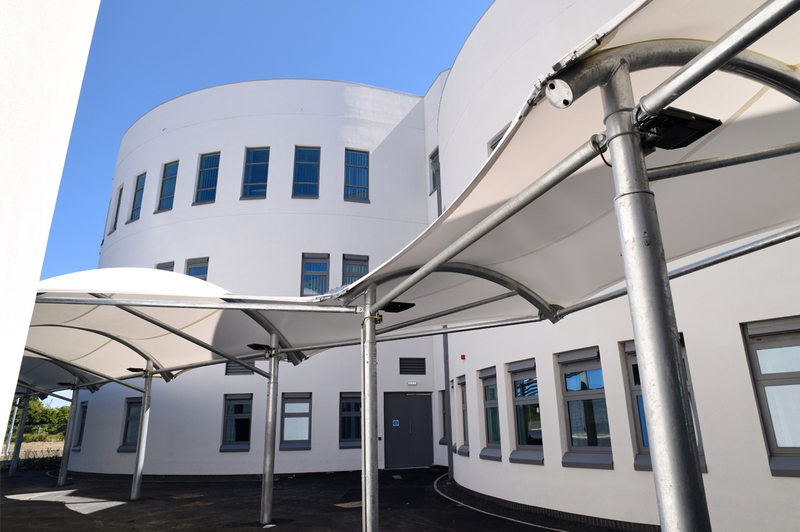 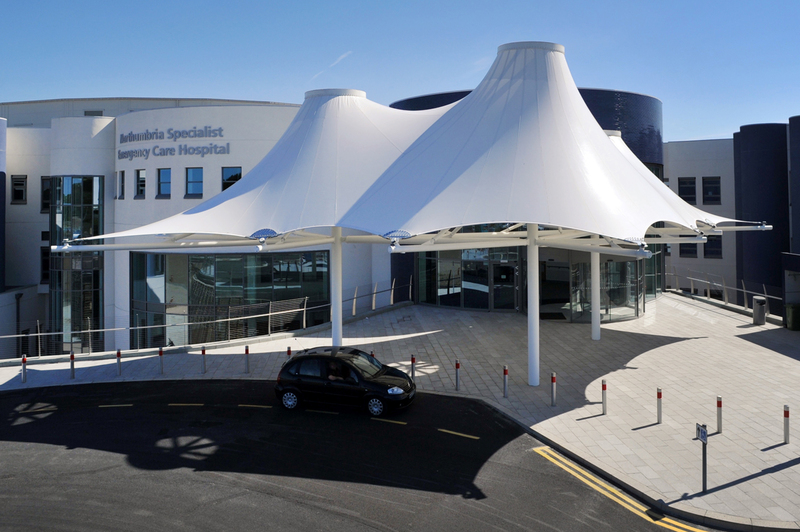 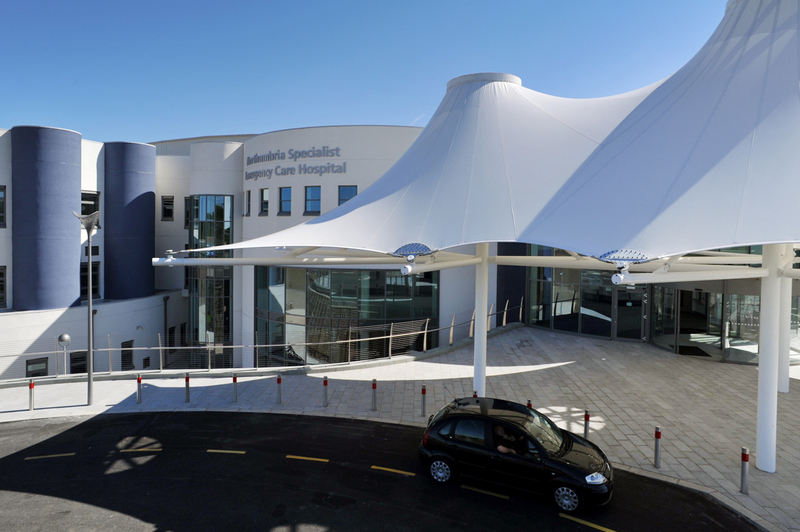 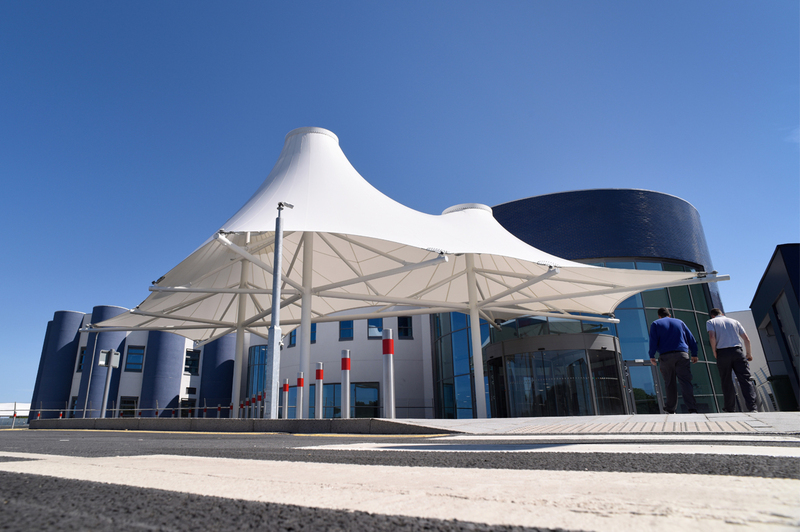 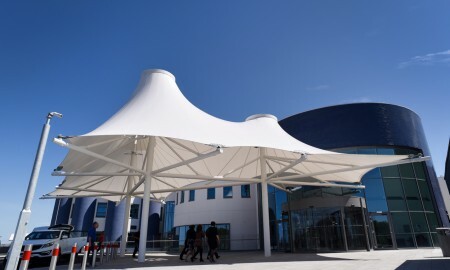 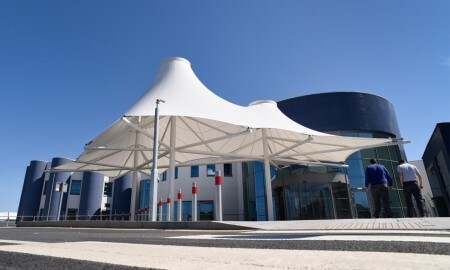 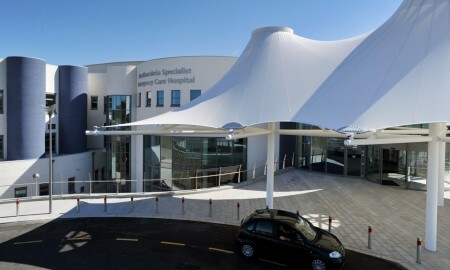 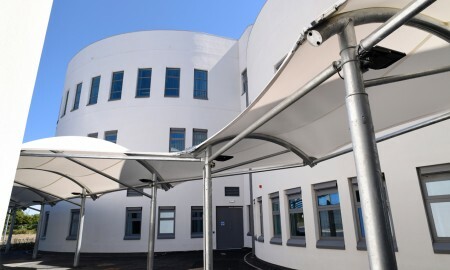 Something eye catching, spectacular in scope whilst fitting the criteria of keeping in line with the new building design and giving maximum weather protection to patients and workers beneath was all part of the agenda to bring a series of canopies that were functional and awe inspiring. 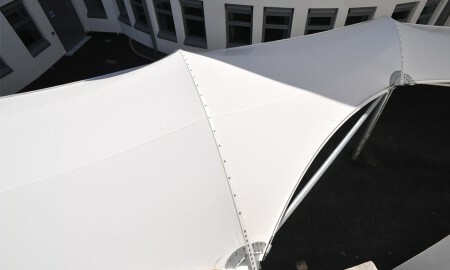 Keep it Kool took three basic elements from its standard product range, a barrel style, a cantilever style and the conic shape. 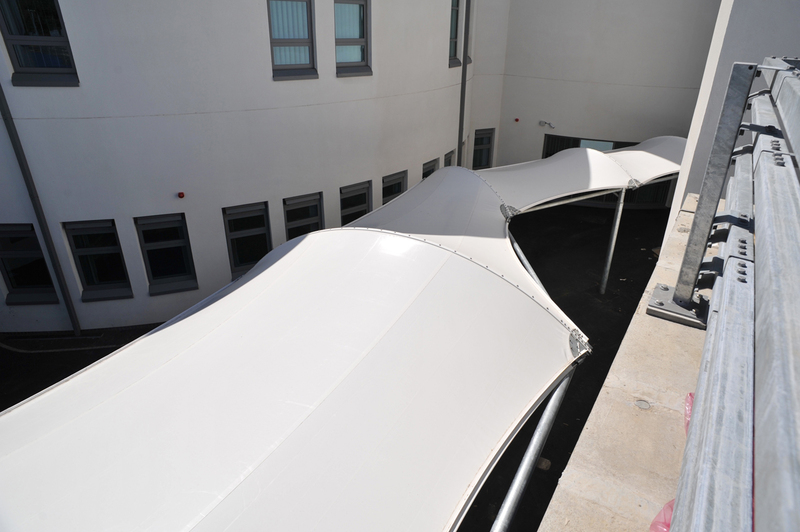 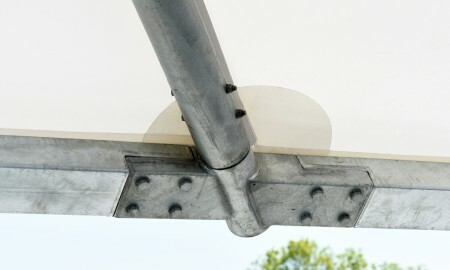 These elements were used to create bespoke canopies in different areas of the hospital. 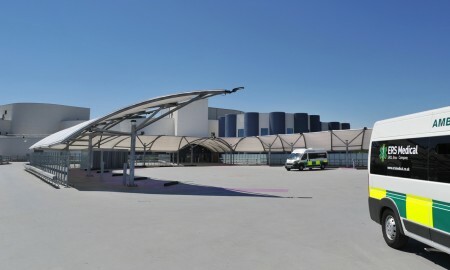 To the main ambulance bay a barrel structure was used to cover the entrance way, this then emanates out to form a cantilever horseshoe style structure to accommodate parked ambulances in bays. 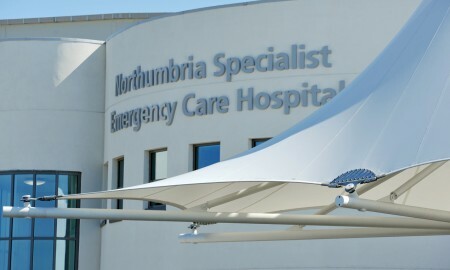 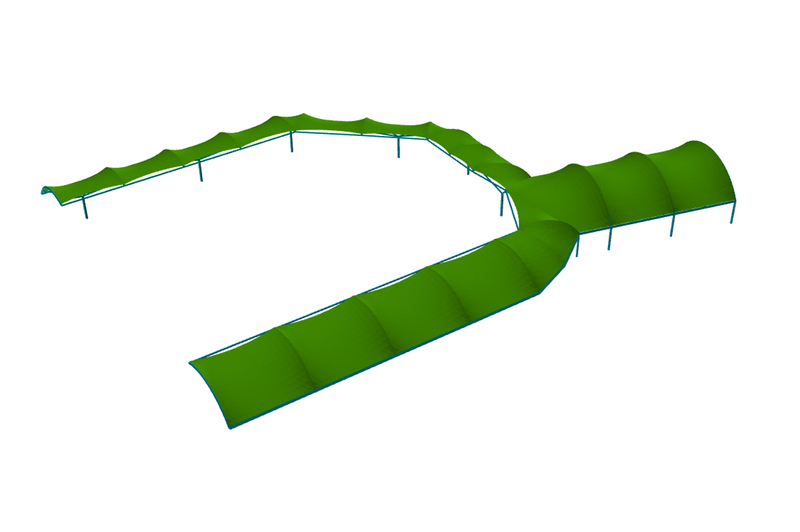 To the area of the hospital where patients are discharged a walkway was formed from the BXTS/BARS/S Northumberland style shelter in a cantilever format. 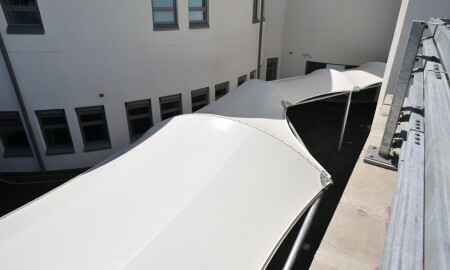 This traversed the building to create a walkway for patients and visitors. 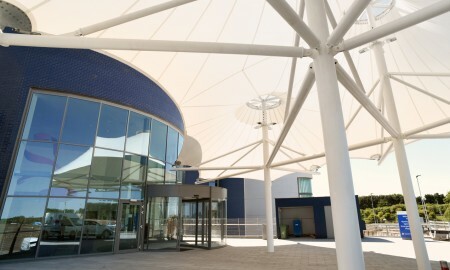 At the main entrance something ‘grandiose’ was required and the original ‘vision’ of the architect had been to create three ‘umbrella’ style canopies. Keep it Kool took their conic style canopy and created a ‘triple’ version of this in a conjoined arrangement to cover the whole entrance. 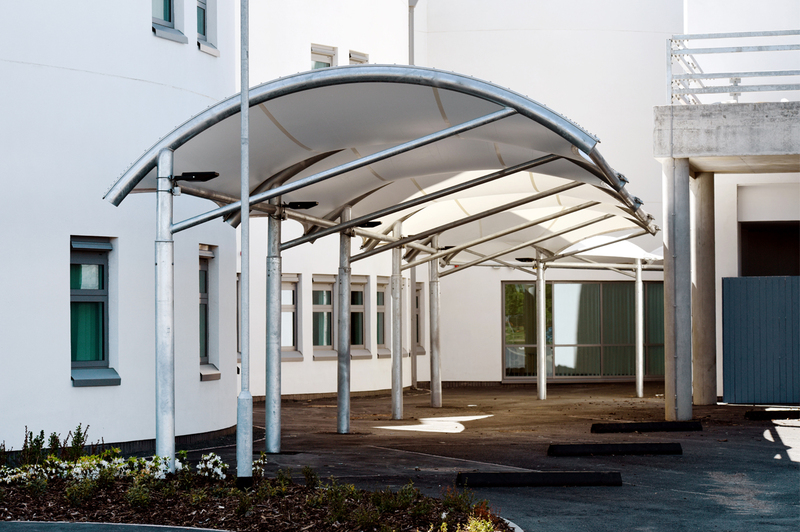 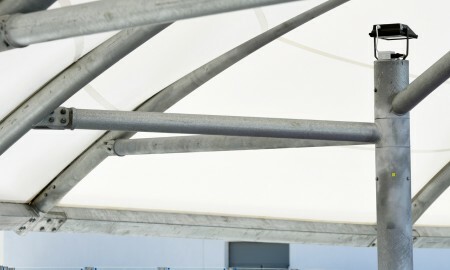 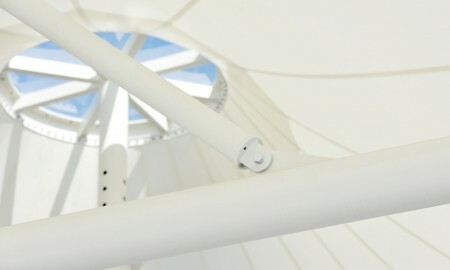 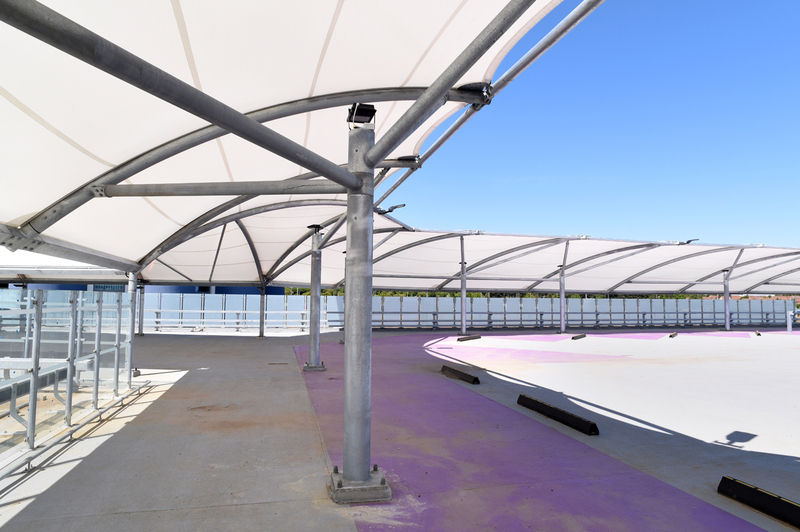 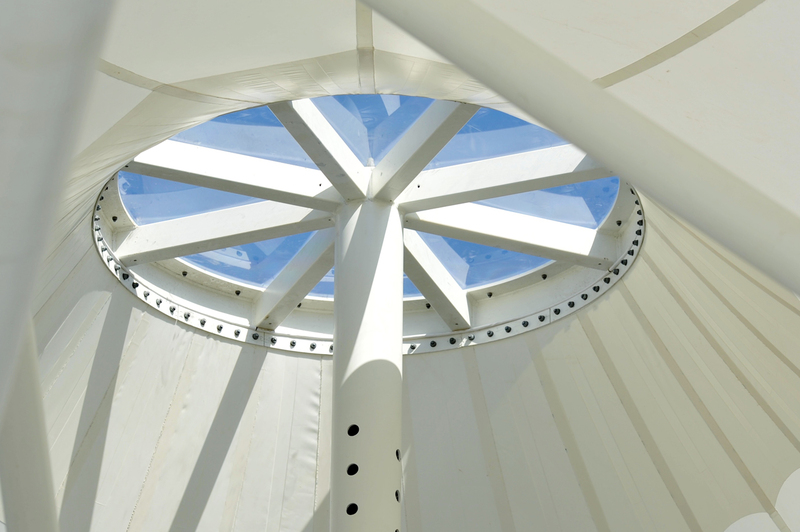 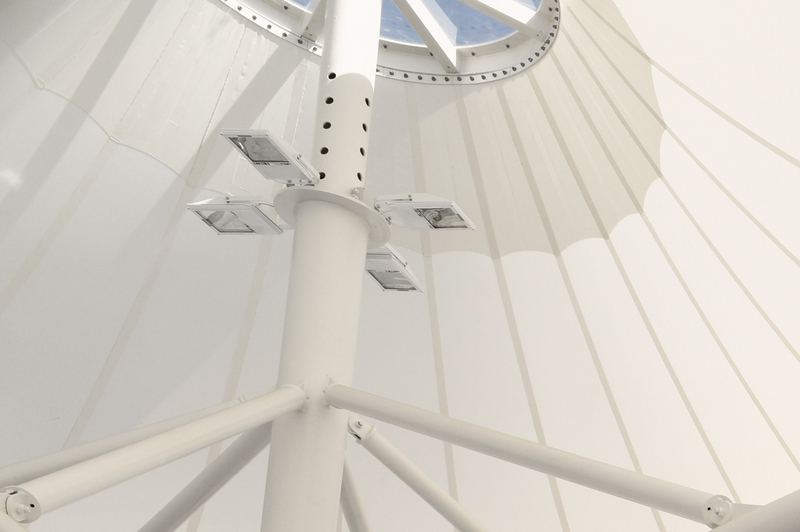 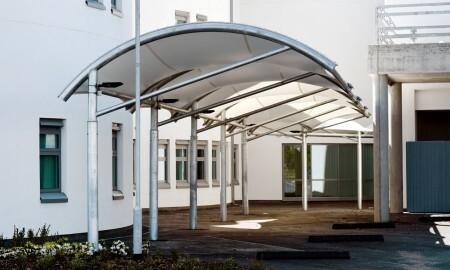 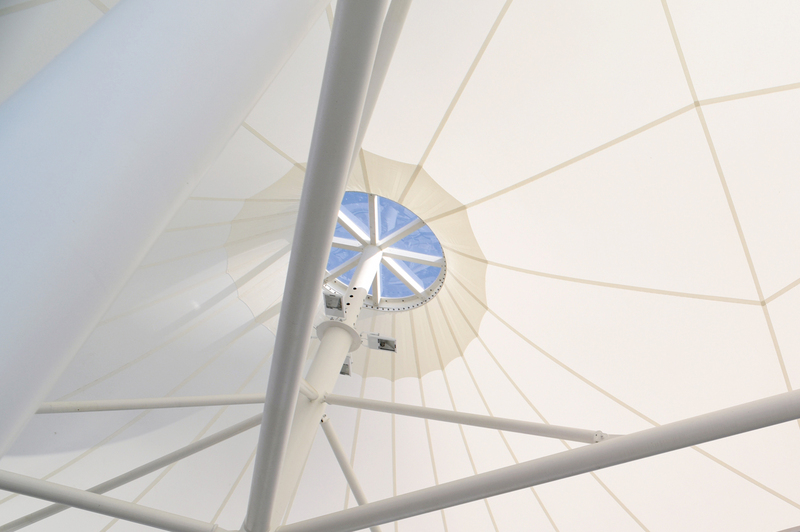 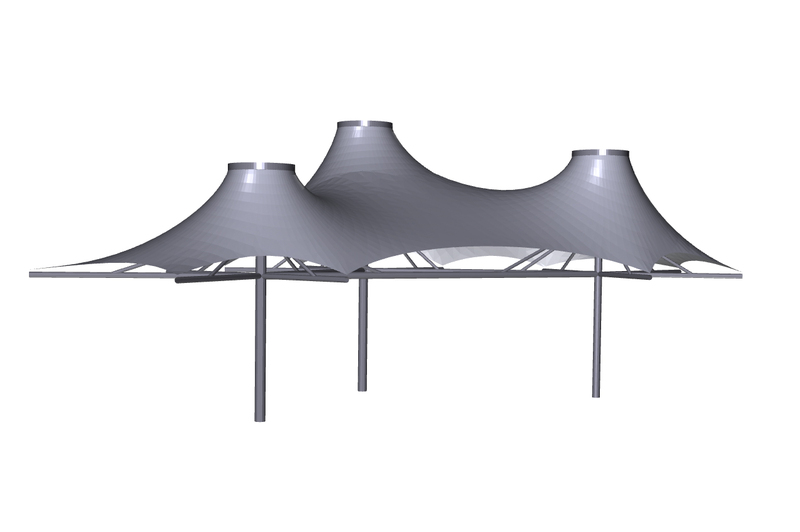 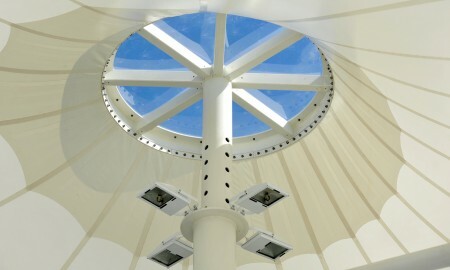 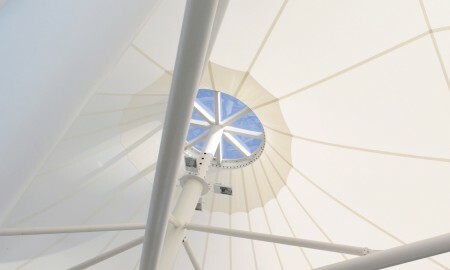 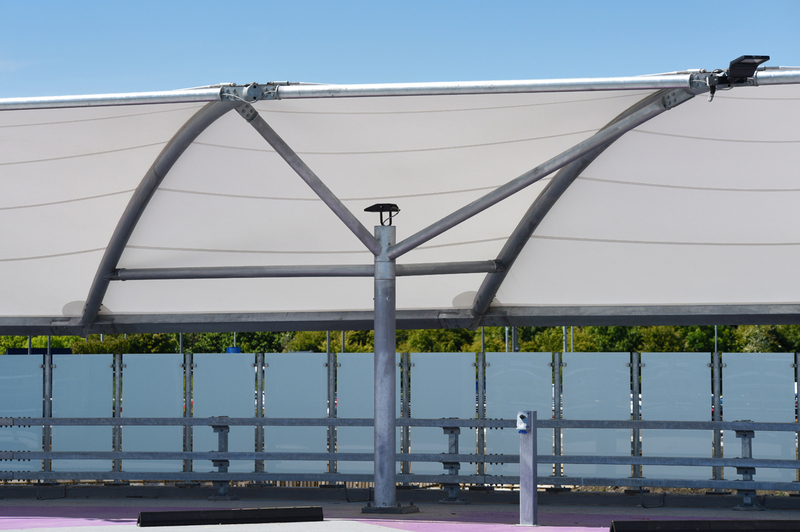 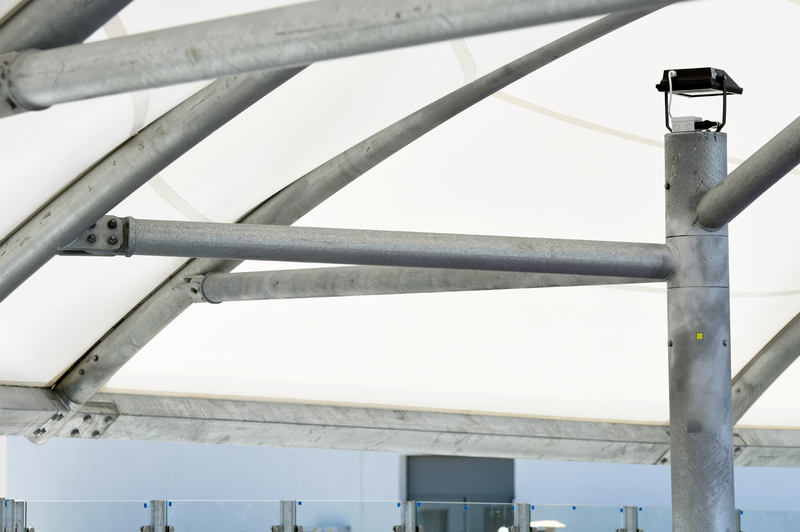 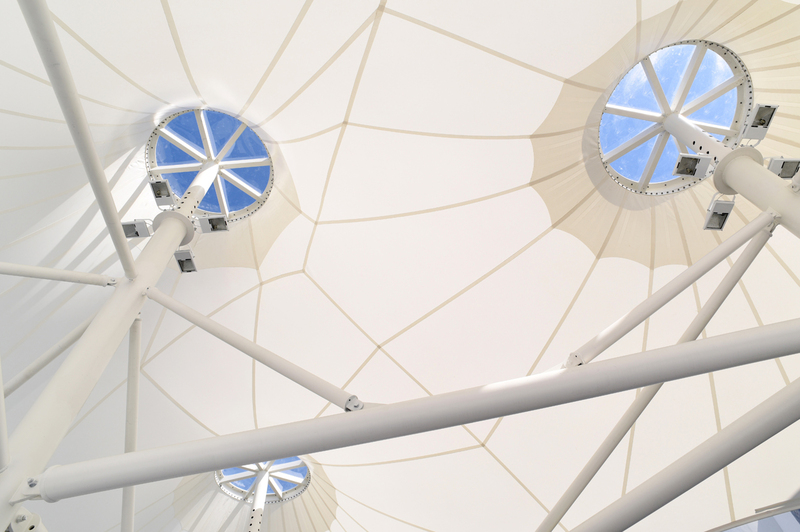 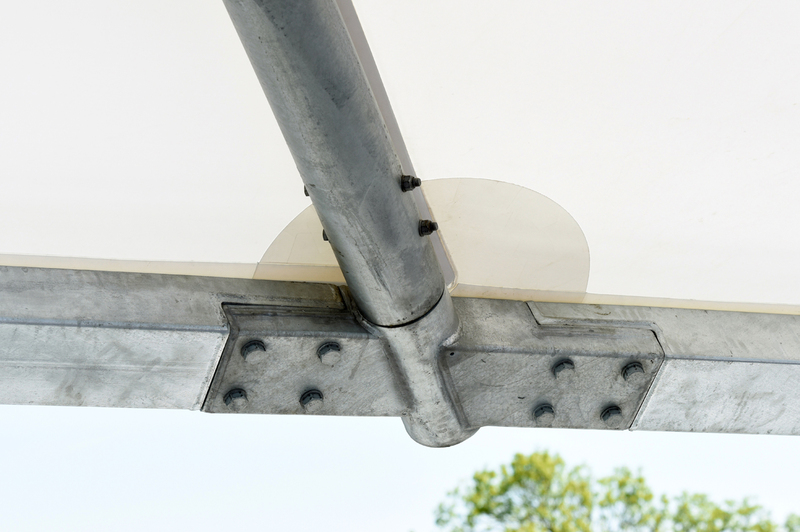 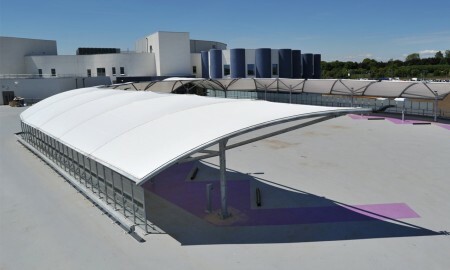 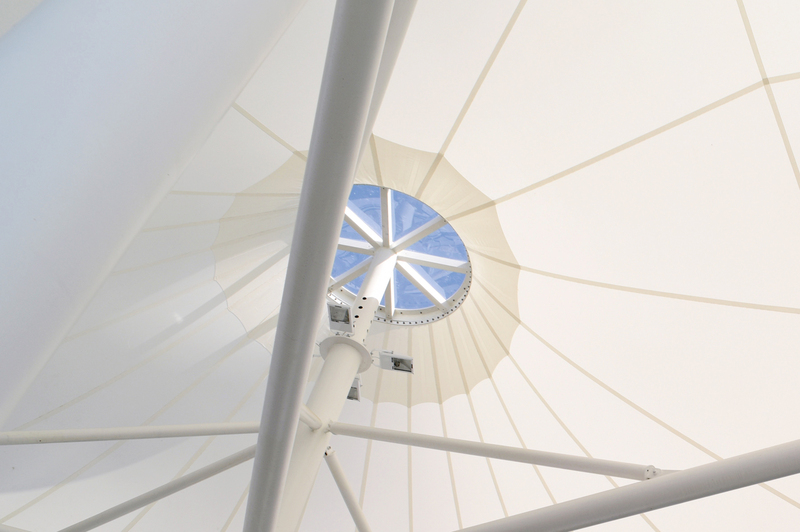 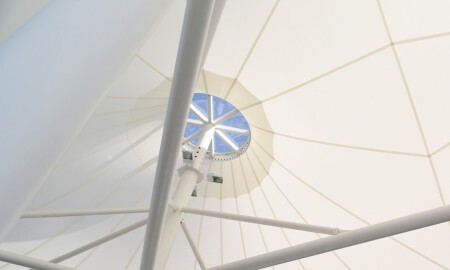 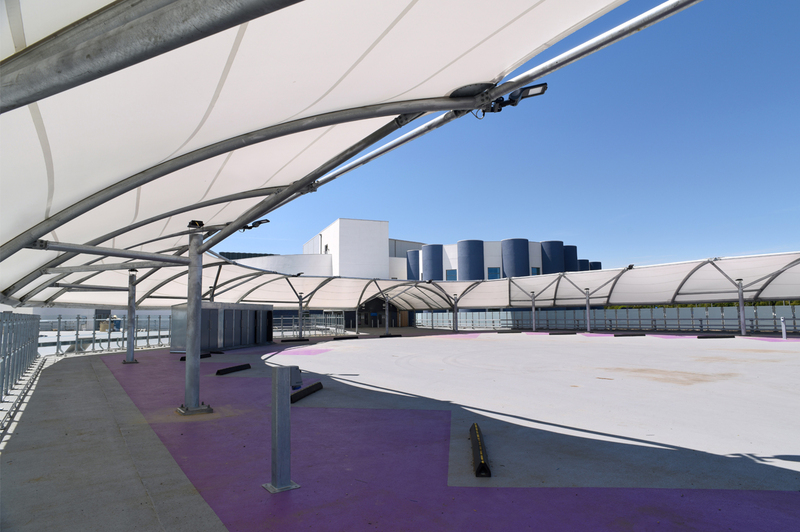 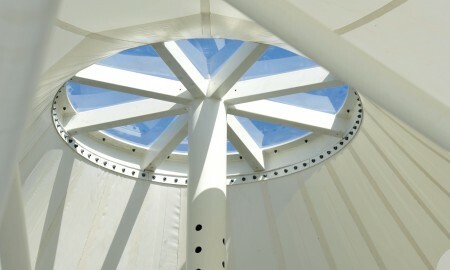 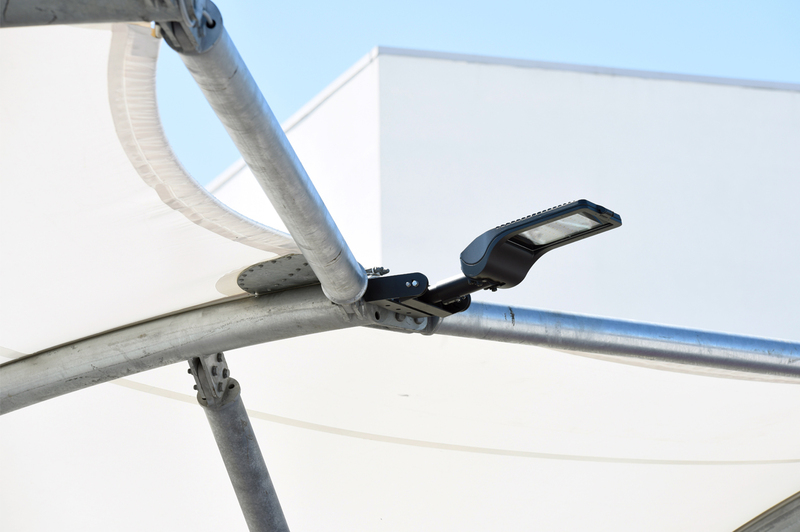 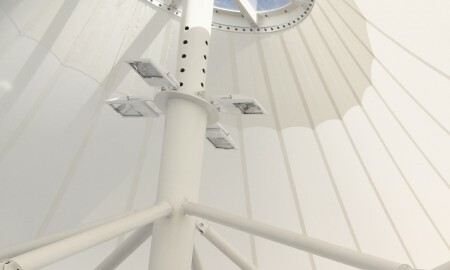 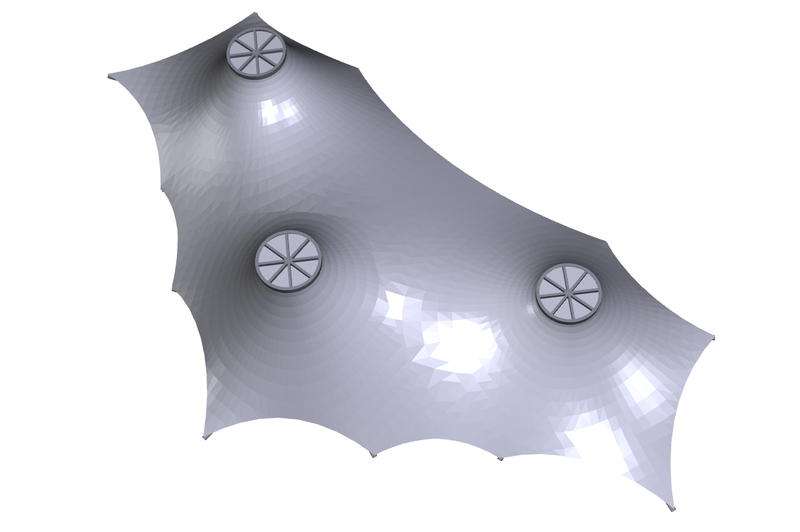 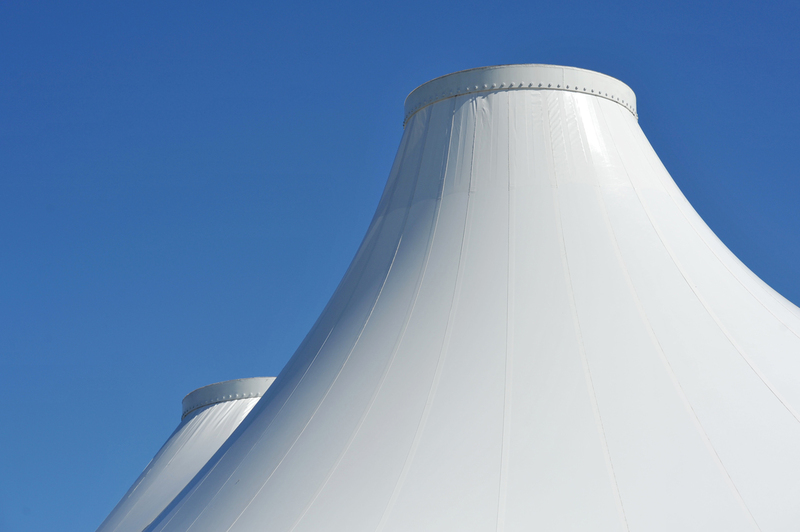 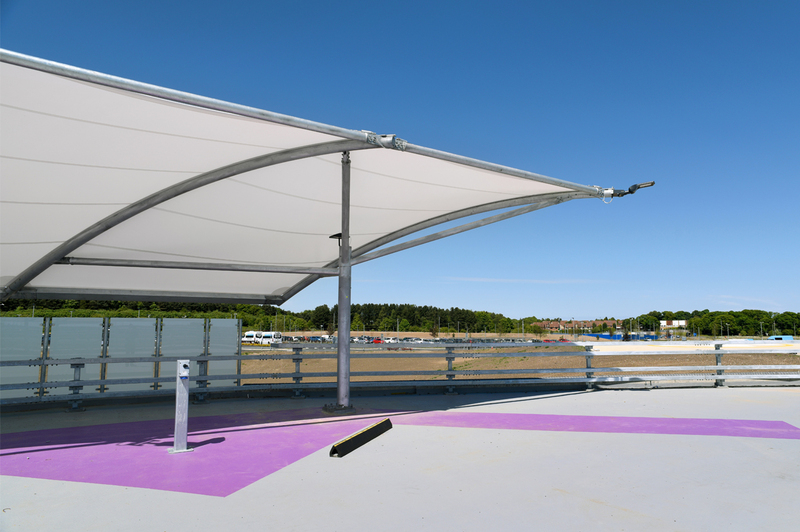 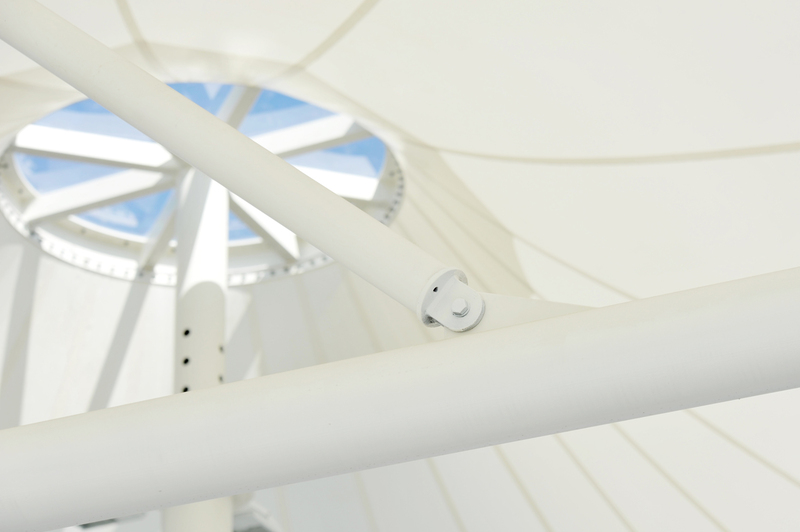 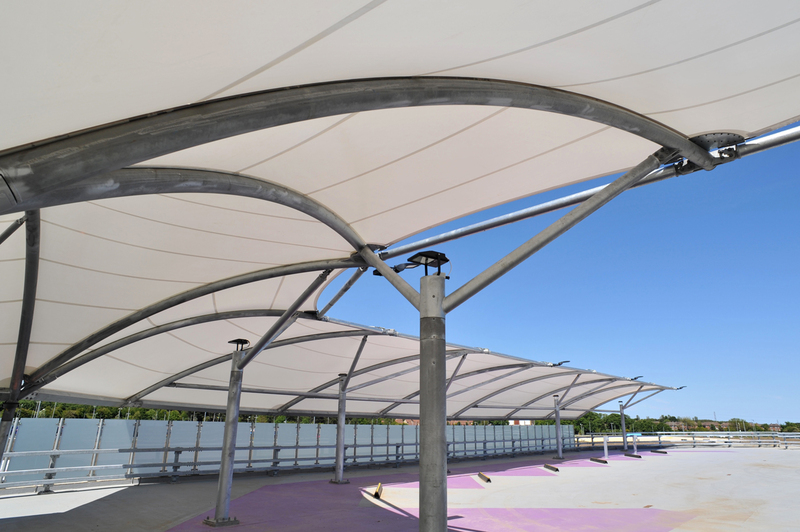 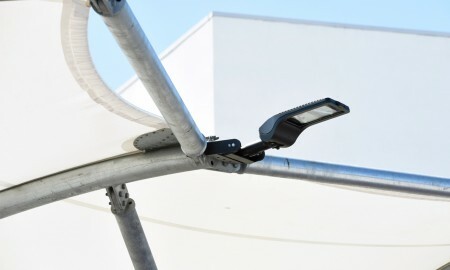 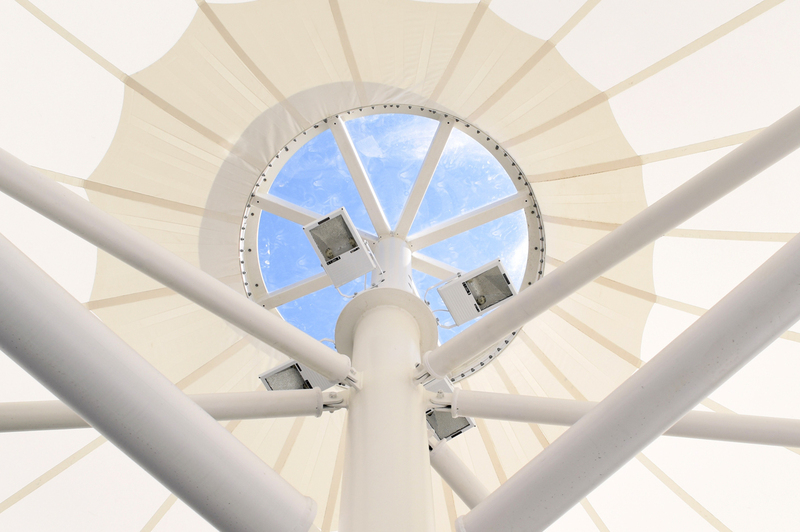 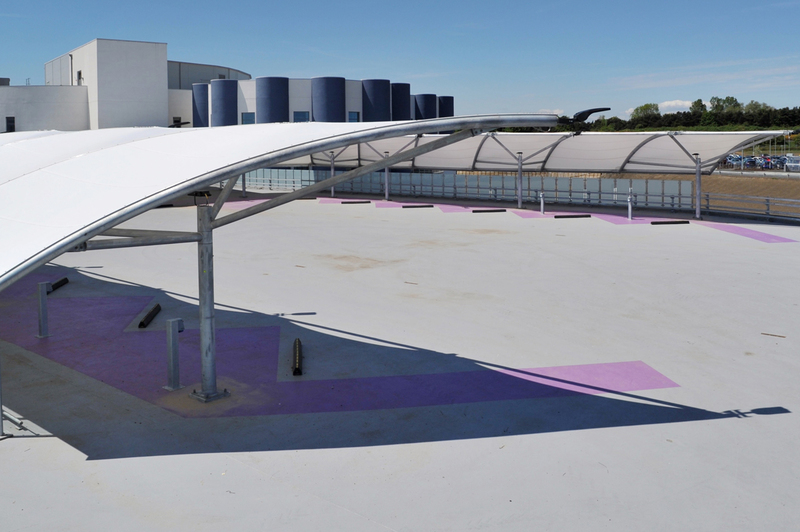 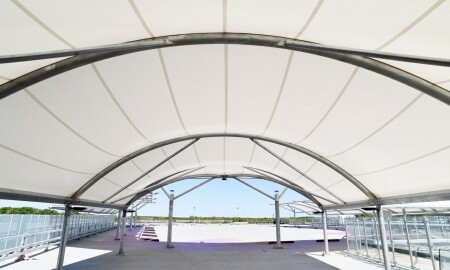 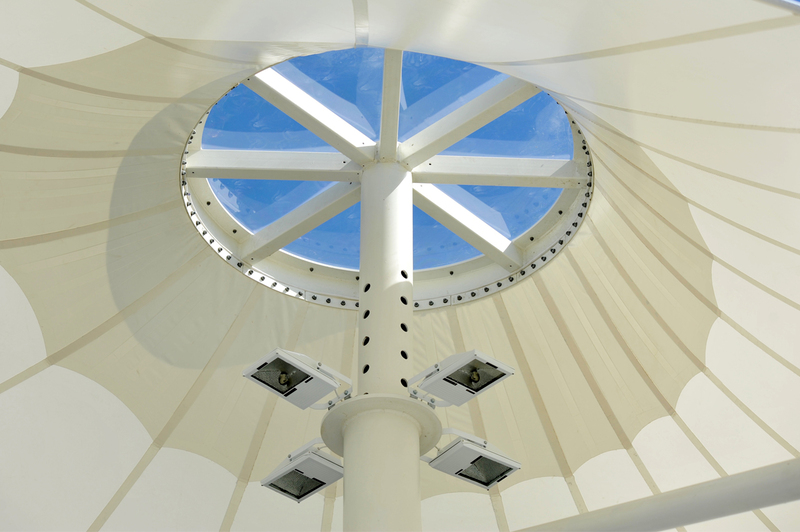 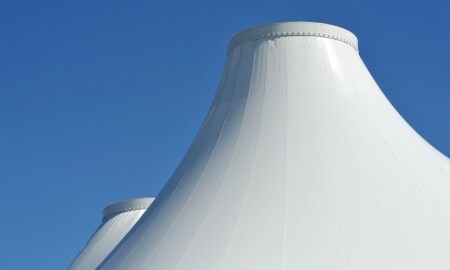 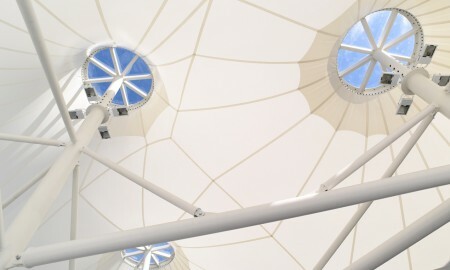 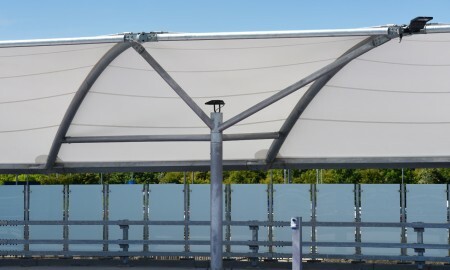 Beneath the structures the space is light and airy whilst completely waterproof and resistant to UV rays, the tensioned Mehler 7211 membrane on each canopy providing a a long lasting and easy to clean canopy solution.